The Investigations - A Good Man Is Hard to Find - My Search for Ronald H. Tammen, Jr.
Carl Knox, dean of men at Miami, was assigned the task of overseeing the university’s investigation. Oscar Decker, who had just started his job as police chief the prior month, led the Oxford Police Department’s investigation. Other agencies to become involved were the Butler County Sheriff’s Office and the Ohio State Highway Patrol. The FBI also stepped in. The first time was in May, after Mrs. Tammen had contacted the Cleveland office to let them know that Ron was missing and to request that a notice be placed in their “Missing Persons” files. They did so, and Ron’s photo was distributed across the country. The FBI’s involvement escalated after Ron violated the Selective Service Act, when he was classified as 1-A (eligible for service) after not renewing his student deferment and, subsequently, not showing up for his physical or reporting for duty on August 25. So, with all of those agencies racking up man-hour upon man-hour in search of Ronald Tammen, one would assume that there would be a good deal of bureaucratic paperwork documenting their efforts somewhere in their respective filing cabinets. But one would be wrong. In early 2008, when the Butler County Sheriff’s Office reopened its investigation to find out if the remains of a body found in Georgia in June 1953 belonged to Tammen, the Oxford PD could provide no archival records on their original investigation. In fact, they’d found only one page on Tammen, a traffic citation that Ron had received the month before he disappeared when he ran a red light at the intersection of High and Main Streets. Carl Knox’s handwritten notes, housed in the Miami University Archives, show the signs of a well-meaning administrator engaged in a harried attempt to delve into the nuances of Tammen’s day-to-day life in hopes of finding a clue. To be sure, this job assignment wasn’t in his wheelhouse. Reading over the penciled-in scribbles, I can picture him on the phone trying to take down pertinent details such as names, figures, and places while storing much of the explanatory background information in his brain. Hence, most pages are cryptic and tough to decipher. Before reopening its investigation, the Butler County Sheriff’s Office had one letter in its Tammen file—an anonymous tip from 2005 that offered few specifics and would have been impossible to pursue. The Ohio State Highway Patrol also produced no documents when I checked with them in 2015. The FBI provided me with 22 pages in response to my Freedom of Information Act (FOIA) request, 9 pages from my appeal, and 1 1/2 pages from my lawsuit. Thanks to a recent discovery of another possible file on Tammen, more pages may be forthcoming. However, far too much has already been destroyed. The earliest hypothesis from investigators—one that was proposed as early as April 24, 1953—was that Ron had experienced amnesia and probably had wandered off, not knowing who he was or where he belonged. They’d already ruled out foul play. Citing his wrestling credentials as evidence, they said that Tammen was “rugged and strong,” and could have taken care of himself. As time wore on, however, some wondered if Tammen may have simply walked away voluntarily. Perhaps the biggest development in the case came at the end of June 1953, when Clara Spivey of Seven Mile, Ohio, came forward and said that a young man who looked like Ron had knocked on her door sometime around midnight on the same night that Tammen had disappeared. Seven Mile is roughly 11 miles southeast of Oxford, though it’s by no means a straight shot, especially on foot. Still, she’d seen a recent article and felt sure it was he. She also was quite sure of the date on which it happened. She remembered telling the visitor about the bus that ran between Oxford and Middletown, and then finding out later that the route had been suspended that very night, April 19. According to the earliest accounts, the stranger’s questions to Mrs. Spivey were: “What town am I in?” and “Where will I be if I go in that direction?”, pointing toward Middletown. The stranger’s “short haircut and deep eyes” were most memorable to her, as was his lightweight checked jacket. He seemed a little embarrassed, she’d said, and there was a smudge of dirt or grease on his face, as if he’d been trying to fix a flat. Some people, such as Oscar Decker, believed wholeheartedly that it must have been Ron, and that her story fit the amnesia theory to a T, while others, including Ron’s brother Richard, noted discrepancies in her story and weren’t convinced. Two clues that were brought to the public’s attention at least 20 years after-the-fact had to do with Dr. Garret Boone, a family physician and coroner for Butler County, and H.H. Stephenson, a housing official at Miami. 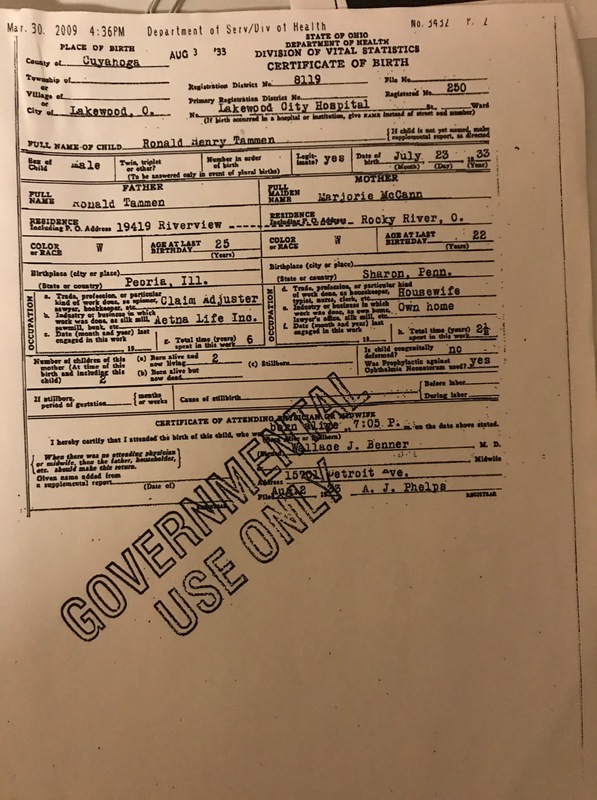 In a 1973 article by Cella, Dr. Boone said that Tammen had visited his Hamilton office on November 19, 1952, five months before he disappeared, and Boone still had the medical record to prove it. Tammen’s reason for the visit was to have his blood type tested, a request that Dr. Boone hadn’t received from anyone else in his 35 years of practice. H.H. Stephenson, who had known Ron and had granted him approval to have a car on campus, thought that he’d seen Tammen in a hotel restaurant in Wellsville, N.Y., on August 5, 1953, as he and his wife were returning home from a vacation. According to a 1976 anniversary article by Cella, Tammen’s lookalike was sitting at a table with a group of men, and he was looking at Stephenson from across the room. “He was sort of looking right through me,” Stephenson said. Unfortunately, Stephenson didn’t say anything to his wife until after they’d left the hotel, and when she convinced him to return to see if it was Tammen, the men were gone. Both Boone and Stephenson had come forward early in the investigation with their information, however university officials had kept their stories to themselves. That’s where things had pretty much stalled, until 2008, when Frank Smith, Butler County’s cold case detective at that time, turned up the heat on the Tammen case. Mike Freeman, a fellow cold case detective in Walker County, Georgia, had contacted him to let him know about a murder he was trying to solve from long ago. The dead body had been found in June 1953 in a ravine outside LaFayette, near U.S. 27, and, after Freeman had conducted some online research, he wondered whether that body might have been Ronald Tammen. Smith and Freeman, along with Walker County Sheriff Steve Wilson, decided to find out if DNA technology could solve the two cold cases in one fell swoop. Marcia Tammen, Ron’s sister, had provided a DNA sample for comparison, and on a sunny February day in 2008, the body was exhumed from an unmarked grave in LaFayette Cemetery. All that was left of the dead man was several bone fragments, which were collected and transported to the Georgia Bureau of Investigation for analysis. Unfortunately, the DNA wasn’t a match. But the publicity brought Smith some tips from local readers and he brought newfound enthusiasm into the case. Smith has since retired and has opened his own business as a forensic polygraph examiner. The Ronald Tammen investigation, though not officially closed, is once again dormant. Just curious what you think of H.H. Stephenson’s story? The Spivey story just doesn’t ring one bit true to me, I hate to say I’m skeptical of a coroner, but I am, but Stephenson…..for no reason at all, I think he was sincerely mistaken. Actually, I think Stephenson’s story is more believable than Mrs. Spivey’s since he knew Ron personally and it happened only a few months after Ron disappeared. When I asked Stephenson’s son what he thought, he told me that his father never forgot a face. As for the coroner, I believe him too, since the news article was written by Joe Cella, who personally vouched that he saw the medical record with Tammen’s name on it. Like I said though, it’s Mrs. Spivey’s story that I’m most unsure about. In 1953, would a student deferment for the draft have been renewed no questions asked? Where did the specific date of August 25th come from? I’m guessing a certified letter sent to his home. I think students had to have proof they were enrolled in classes in order to be granted a deferment. 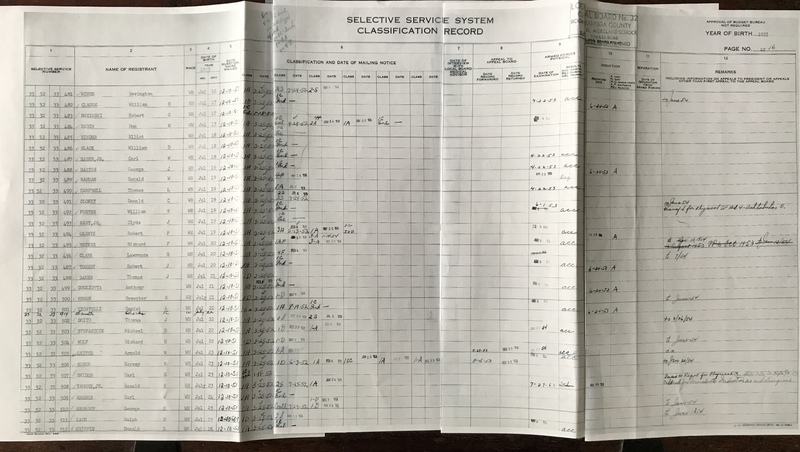 I just checked my working timeline, and, based on Selective Service records I’ve procured, it says that August 25, 1953, was Ron’s reporting date for induction into the Armed Services. In remarks field of that SS document, they had written: “Failed to report for physical. Complete file to Hqts 9/8/53. Ordered for immediate induction as a delinquent.” I’ll post the originals in the next couple days. On April 19th, had he received notice of the August 25th date? 7/26/51	Ron, at 18, registers for draft. His Selective Service number is 33-32-33-508. 3/25/52	Selective Service mails 1st notice to Ron. He’s listed as class 1A: Available for unrestricted military service. 7/15/52	Selective Service mails 2nd notice to Ron. He’s now listed as class 2S, which means he got a deferment as a student. 6/24/53	Selective Service mails 3rd notice to Ron. He’s listed as 1A again: Available for unrestricted military service. 7/27/53 Date that Ron is supposed to show up for his physical. His record is marked “Del” for delinquent. As for the radio silence of late, I’ve been in full research mode. There will be one more post before 4/19–this next one on why Ron’s fingerprints could have been labeled criminal. Stay tuned.